I know this is going to sound crazy, but when I made the popcorn cauliflower for my son the other day, I was reminded of this awesome snack I get sometimes at The Brickyard Restaurant in The Little League Capitol of the World… Williamsport, Pa. I love this snack because it takes me back to my childhood and the popcorn my mum-mum used to make. She would pop our popcorn in … bacon fat! Not the kind of thing you should eat every day, but oh so good. I’m not quite sure how they make theirs, so here is how I make mine. Cook the bacon to crisp and reserve about 2 tablespoons of the bacon fat. Set bacon aside to cool. Pop popcorn in an air popper or micro air popper. Cook popcorn in microwave on high for 3.3 minutes, (depending on how powerful your microwave is). Once popcorn is popped, melt 2 tbs of butter in the bacon fat. 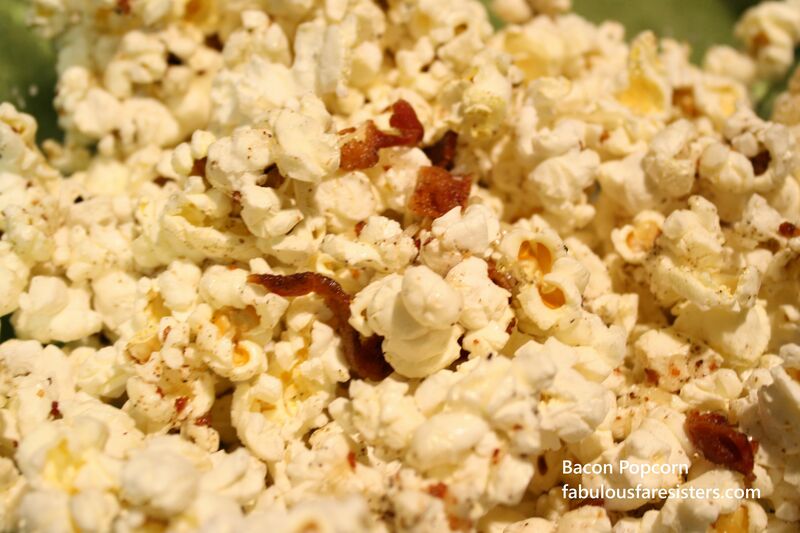 Drizzle bacon butter over popcorn. Mix in the cheese, bacon, garlic salt and pepper. Snuggle into a deep sofa and it’s snack time with a movie. Thanks Linda, I made plenty while we were growing up. Heidi -you make THE BEST popcorn!! Popcorn is my best ever food! I named my dog after it, I love it so much! I do too! I lived on popcorn in college and when I’m alone with no one else to cook for… I make popcorn! Sometimes I mix it with tomato paste, Italian seasoning and parm cheese. To me the options with popcorn are, ‘Sky’s the limit’. I love this idea! I save bacon fat for green beans and many other foods but never thought of popcorn. I’ll have to give it a try! Please do. Bacon fat is great for so many things. I love to hear that fellow foodies use bacon fat. My daughter calls bacon the pixie dust of food.